Amazing? Not to anyone who has ever seen or read anything about this comic book character. He does just what you expect from a superhero including flying around amidst tall buildings and saving people in distress. There’s nothing amazing about that so the title is a bit of an exaggeration. But that’s Hollywood for you. 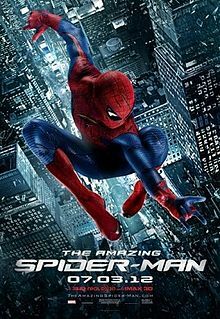 Unless you’ve seen some of the marketing publicity it will come to you as a surprise that the film is about the creation of Spider-Man and the first hour is devoted to just that. Only then do things pick up with the result that the movie that is far too long at almost two and half hours. The trouble is, there is hardly anything original in the storyline after the prologue and as a consequence it is so déjà vu. for sequences of action and violence. The police dispatcher requests that the officer respond to a 10-30 then goes on to give a description of the suspect. A 10-30 police code is for an emergency at the station. The correct code in this instance should have been 10-27 for a suspicious person or vehicle.